What is the IV drip rate? This drip rate calculator will help you determine the rate of applying a liquid drug in intravenous therapy. 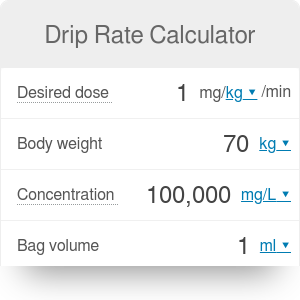 You can use this IV drip calculator to determine either the drip rate in ml/min or the flow rate in gtts/min (drops per minute). If you are not sure what values should you provide as the input, keep reading for a step-by-step explanation of how to calculate the drip rate. We will also provide you with a drip rate formula, which can be used for manual calculations. In an IV (intravenous) therapy, the drip rate is defined as the rate of application of a liquid drug required to provide a certain dosage per minute. For example, imagine that you know that your patient needs 1 mg of a certain substance every minute. If you know the solution concentration, you can easily calculate how many ml of the drug should you provide every minute. The flow rate is very similar to the drip rate. The only difference between the two are units - flow rate is measured in gtts/min (drops per minute). Desired dose is the dosage of the drug, expressed in milligrams per kilogram of body weight per minute. Weight is the weight of the patient, measured in kilograms. Bag volume is the total volume of one bag of the liquid medicine, expressed in milliliters. Drug in bag is the mass of the medicine in the drug solution, measured in milligrams. Drop factor is the number of drops (gtts) per a milliliter of the liquid substance. Determine the desired dose of the drug. let's assume you need to provide 0.02 mg/kg/min. Measure the weight of the patient - let's say that in this case, it is equal to 85 kg. Choose the drug solution. Let's say you provide bags of 10 mg of the drug dissolved in 40 ml of water. You need to set the drip rate at 408 ml/h. You have to set the flow rate at 68 gtts/min. Drip Rate Calculator can be embedded on your website to enrich the content you wrote and make it easier for your visitors to understand your message.